Leo Halsdorf was born in 1979 in Luxembourg, where he started to play the horn aged ten in the class of Marc Bouchard at the Conservatory of Luxembourg-City. In 2001 he gave up his maths studies to focus on his passion, music. He started to study music in Maastricht Conservatory with Prof. Erich Penzel, and after obtaining his diploma, he continued advanced studies in Stuttgart with Prof. Christian Lampert. 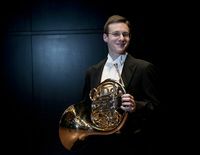 After just one year of studies, he won his first job in the Aachen Symphony Orchestra, to be hired shortly afterwards as associate principal horn at the Bavarian State Orchestra. He switched on the same position to the Lucerne Symphony Orchestra, and was hired one year late as principal horn at the Hamburg State Opera. From 2006 until 2012 he was principal horn of the Düsseldorf Symphonic Orchestra. There he was tutor of the Orchestra Academy of the Düsseldorfer Symphoniker, thus teaching students both in preparing for auditions and improving their playing and musicality. Since October 2012 he returned to Luxembourg, where he plays as principal horn with the Orchestre Philharmonique du Luxembourg. Being a passionate chamber music lover, he plays concerts as often as possible together with string players, woodwind and brass players in various iformations.